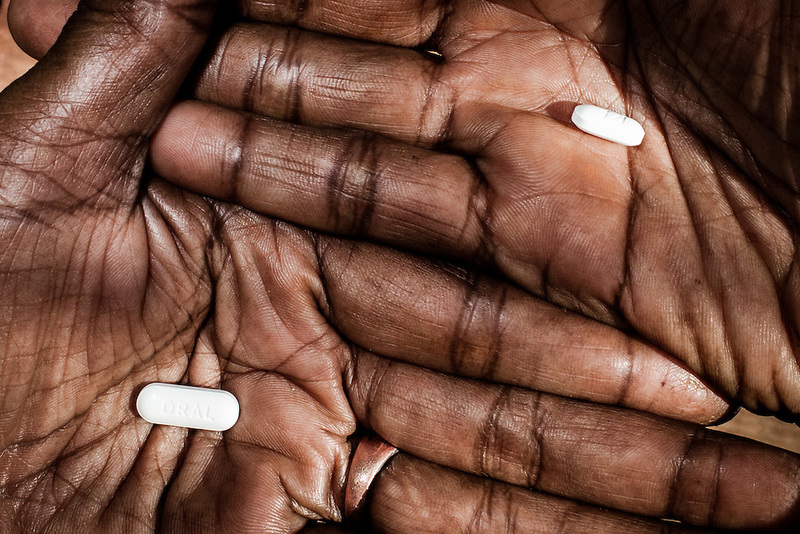 Mama Yuli holds two ARV pills in her hands on the 8th year anniversary of undergoing Anti Retroviral Treatment (ART). In 2004 Mama Yuli contracted the HIV virus from her husband who later died from AIDS. At her worst point, Mama Yuli was just skin and bones weighing only 22 kilograms (48 pounds). With ARV she is now healthy to work and support her family. If taken properly and regularly, ARV has been proven to prolong the survival rate of people living with HIV/AIDS and enables them to live a productive life. The Indonesian government started providing ARV therapies in 2003. In that year only 7 packages of ARV were purchased for all of Papua. Each package cost approximately $5000. Today in Indonesia this vital medication can be obtained at no cost only in Papua but only 12% of those with HIV/AIDS are undergoing ARV therapy. Despite these advances, ARV is mostly available only in cities. Collaboration between health facilities in urban centers and staffs in rural areas to make ARV more accessible for patients living in the countryside is still lacking as well as the endorsement of ARV as a legitimate medicine for HIV/AIDS. Sometimes health staff and even educational materials still provide misleading information and perception such as "there is no medicine for HIV/AIDS." As a general practice health personnel often evaluate patients for their adherence in taking their medication and keeping up with appointments before allowing them to undergo ARV therapy. Indigenous Papuans tend to fall short of this assessment and fail to return for their check-up because many of them live too far from the health centers. At times, they do not fully understand the benefits of ARV medication and the importance of taking them properly due to poor counseling from the health staff. Also, many of them are unable to keep their appointments or take medication regularly because they still keep their status a secret from their immediate family members or spouse.